Unlike our own bony skeleton, which keeps the same arrangement throughout our lives, the cellular cytoskeleton is dynamic, continuously morphing in response to cellular signals. 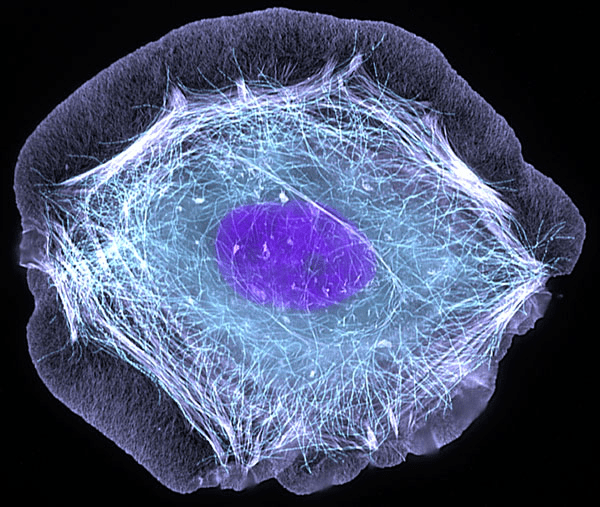 In this image, cytoskeleton remodeling of the skin cell was triggered by addition of a growth factor, which produced protrusions of the cell edge and the characteristic “fried egg” shape of this cell. These protrusions have little “feet” that help the cell move forward. The Wittmann lab recently used these skin cells to model the complex choreography by which microtubules control cell movement . Microtubules do more than give cells mobility. They serve as an intracellular transportation system that carries proteins from one region of the cell to another. But unlike fixed, human-built roadways or train tracks, the microtubule network is constantly changing, in response to protein supply and demand. Check out this video that Andreas Ettinger, a postdoctoral researcher in the Wittmann lab, made of microtubules continuously remodeling in the cell. If you’re wondering whether Wittmann just snapped this photo, it wasn’t quite that simple. Fluorescence microscopy images like this one, in which different cellular structures are labeled with different fluorescent probes, are first created in a greyscale. Color images are generated afterwards. Wittmann, who enjoys creating scientific works of art, decided to add colors that would give the image a more artistic feel. His decision earned his image a place in the Life: Magnified exhibit! CLASPs link focal-adhesion-associated microtubule capture to localized exocytosis and adhesion site turnover. Stehbens SJ, Paszek M, Pemble H, Ettinger A, Gierke S, Wittmann T. Nat Cell Biol. 2014 Jun;16(6):561-73.